Caption slip reads: "Photographer: Forbes. Date: 12-01. Reporter: Adler. Assignment: Las Posadas. 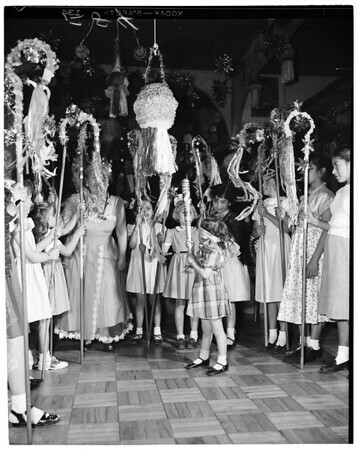 31-32-83-84: Ethel Alvarado, 4, in center, blindfolded, tries to shatter La Pinata, a jar filled with candies -- with other orphan girls making circle around her. Consuelo de Bonzo, owner of La Golondrina Cafe on Olvera street, on left side of circle."